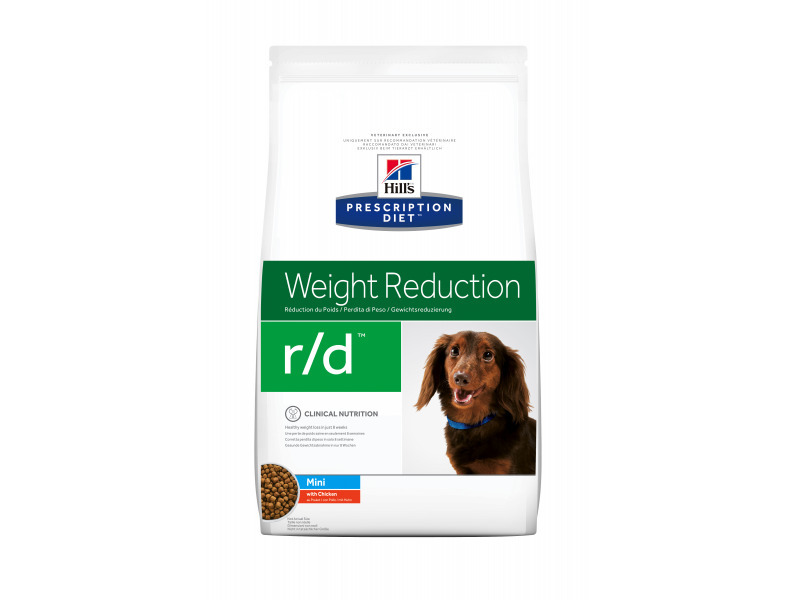 Hill's Prescription Diet Canine r/d has been developed for the nutritional weight control of obese or overweight dogs. Not only can obesity cause discomfort for your dog but it can lead to the onset of numerous obesity-related illnesses and debilitating conditions, related to reduced energy levels, heart disease, diabetes and arthritis. Poor diet that is high in protein and fat is one of the leading causes of obesity and obesity-related illness. Hill's Prescription Diet r/d has been designed specifically for the management of weight in susceptible dogs, containing reduced calories, natural fibres and nutrients included to help burn fat and promote healthy muscle mass. These ranges are a starting point only, because dogs' needs vary. Adjust the feeding amount as necessary. To correct obesity, the amount to be fed should be based on the estimated ideal weight (target weight) and not the weight when obese. Fibre High Obesity: provides increased dietary bulk which aids satiety and avoids hunger. Ingredients (Normal dry): Chicken: Maize, chicken 24% and turkey meal, maize gluten meal, cellulose, pea bran meal, dried beet pulp, digest, animal fat, minerals, DL-methionine, L-Lysine, flaxseed, L-carnitine, vitamins, taurine, trace elements, L-tryptophan and beta-carotene. With a natural antioxidant (mixed tocopherols). Ingredients (Mini dry): Chicken: Maize, chicken (24%) and turkey meal, maize gluten meal, cellulose, pea bran meal, dried beet pulp, digest, animal fat, minerals, L-methionine, L-lysine, flaxseed, L-carnitine, vitamins, taurine, L-tryptophan, trace elements and beta-carotene. With natural antioxidant (mixed tocopherols). Ingredients (Wet): Original: Pork, soybean mill run, rice, cellulose, soybean meal, digest, soybean oil, minerals, vitamins and trace elements. Coloured with iron oxide. Composition Europe : Original: Pork, rice, soybean mill run, pea protein, soybean meal, cellulose, soybean oil, minerals, digest, vitamins and trace elements. Composition Europe (label): Meat and animal derivatives, derivatives of vegetable origin, cereals, vegetable protein extracts, oils and fats, minerals. After reaching the target body weight, a dog should be fed Prescription Diet™ Canine w/d™ to maintain its ideal weight. In case of mobility problems, Prescription Diet Canine j/d™ Reduced Calorie can be given. The use of a unique nutrient combination to down-regulate the expression of genes associated with fat accumulation exemplifies Hill's leadership in nutrigenomics. 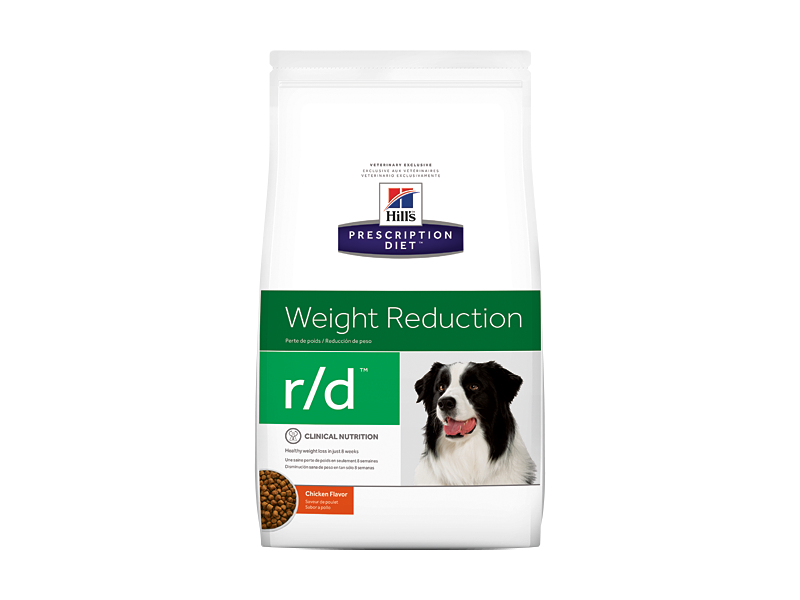 Below are some recent questions we've received regarding Hill's Prescription Diet r/d Weight Reduction Dog Food, including answers from our team. The Association of American Feed Control Officials (AAFCO) is an American organisation and you would have to go to their website to find out information from them. They have no jurisdiction over foods sold in the UK, which is where we are based. High fibre diets like this are commonly used to help with the treatment of diabetes in dogs. You should make sure your vet knows what diet you are using and you follow all other instructions. Hills r/d is used for overweight dogs with diabetes and w/d is used for dogs of healthy weight with diabetes. There are other (eg. high protein) diets which can also be used as an alternative, but it is best to use whatever your vet advises.